The Roman Theatre and its Surroundings and the "Triumphal Arch" of Orange comprises two of the best remaining examples of Roman theatres and arches. The Theatre was built between 10 and 25 A.D., as one of the first Roman public buildings in this region. It owes its fame mainly because of its imposing façade or stage wall, which is 103 metres long, 1.80 metres thick and 37 metres high. 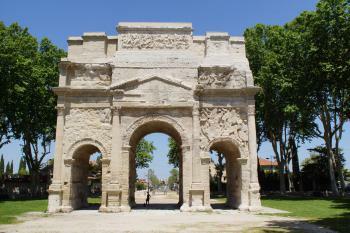 The Triumphal Arch was a commemorative urban arch acting as the gateway to the town and celebrating its Roman founders. 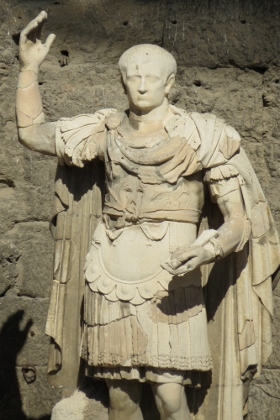 Roman Orange was founded in 35 BC by veterans of the Second Gallica Roman legion as Arausio (after the local Celtic water god), or Colonia Julia Firma Secundanorum Arausio. It was the capital of a wide area of northern Provence, which was parcelled up into lots for the Roman colonists. As WHS and cities go, this isn’t among the best. I visited Orange on a half day trip from Avignon. I arrived by train (the ride takes only 14 minutes) and walked to both monuments that lie about 10 minutes away. The city looks somewhat impoverished, and doesn’t invite to linger after you’ve seen the WHS. It is run by a far right-wing mayor, and I wonder if his election was the result of the decay or that it has caused it. First I made my way to the Triumphal Arch just a little north of the city center. There are a few signposts and the object is big enough to see from some distance. It stands in the middle of a roundabout nowadays, but there’s enough empty space around it to be able to observe the arch. Its reliefs are remarkable indeed, especially the ones at the top. I was the only visitor, and there’s no entrance fee or guard. The Roman Theatre is a bit more of a tourist spectacle, though I get the impression that most of the large tour buses that whisk Japanese, Chinese and Americans around the Provence omit Orange from their journeys. An audio guide is included in the 9 EUR entrance fee, and worth listening to when you’re seated on one of the benches inside the theatre. It for example points out the new (glass) stage roof, which was added in 2006 and preserves the ancient acoustics. The stage itself is massive of course, but lacks the original decoration. Only one statue has been replaced, made out of bits and pieces that were found. Orange is the northernmost site of the WHS hotspot in Provence. As mentioned by other reviewers, the city has not much to offer apart from the Roman Theatre and the Triumphal Arch. Thus, a half day is enough time to properly visit the site. The Roman Theatre is the main sight in Orange, the stage wall is amazingly well-preserved. But there are only sparse remains of the original decoration: a few pillars and the imperial statue of Augustus in the central niche. Some more finds of the archaeological excavations are shown in the nearby museum. “The finest wall in my kingdom”, as Louis XIV has described the theatre. We sat down on one of the upper terraces, listened to the audio guide, and we tried to imagine how the stage might have looked almost 2000 years ago. The theatre is still a venue for concerts and performances, it houses the summer opera festival Chorégies d'Orange. As an opera fan, I would love to see a performance, but unfortunately June was too early, the festival was in July and August. The terraces for the spectators were carved out the hillside, favourable for the stability of the construction and the acoustics, but only the first three of the original rows have been preserved. The Triumphal Arch (photo) is just a short distance from the city center in the middle of a roundabout. The reliefs and decorations are very well preserved. Restoration work was carried out a few years ago and the arch appears again in bright white. Only three Roman theaters worldwide still retain the scene. This makes the Roman theater of Orange a must for lovers of archeology. Even today the theater is used and that makes it alive, although the others can feel some discomfort seeing the scene occupied by a stage full of lights and amplifiers which can make the theatre lose a little of his charm. The triumphal arch is the second well-preserved monument of the city, just steps from the city center: recently cleaned, it is in good condition (like the theater). I visited this WHS in May 2012. I was really pleased to see how well the amphitheatre was kept and really surprised by how large it was! The view from the top is outstanding. 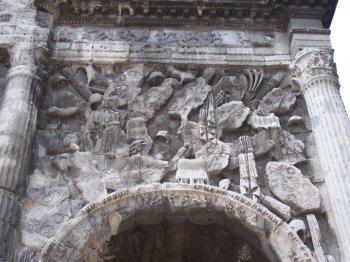 More attention should be given to the Triumphal Arch of Orange which offers interesting Roman carvings and sculptures. Unfortunately, it is quite away from the centre of Orange and it is currently in the middle of a roundabout with a lot of traffic passing by. After seeing both sites I felt that they both deserve the same attention as UNESCO has rightly inscribed both as one WHS. The historic site of Orange presents one of the better preserved roman theatres of the world. Not only is the tier still in place but also the stage and the façade where you can see the old columns and sculptures. You can also walk in the wings, under the tier. Close to the theatre, some building ruins are still in place and testify of the development of the city two millenniums ago. A short walk from here leads you to the Triumphal Arch that has conserved its beautiful sculptures. The Theatre is really amazing by its state of conservation and its architecture. With sites of Arles and the Pont du Gard, it is part of the greatest and most famous Roman remains in France. The site is well furnished with explication boards and guides and will allow visitors to enjoy a bit of the Roman life. We visited Orange in April, 2008 and were very impressed by the theatre and the Arch. The theater is very well preserved and the tour which is available with hand-held tapes is very interesting and thorough. Sitting in the seats and scrambling up the steps to the top rows brings the history alive. 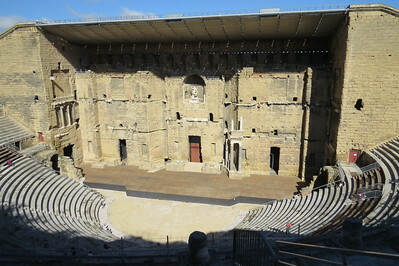 The arena at Nimes is larger, but the theater is just as notable. Check out the restaurant across the street-La Vaca-it's wonderful. I was a little dubious going here as to whether it would be worth a visit, or even its place on the World Heritage list, as there are already plenty of other examples of Roman Theatres included. However, I was shocked. The theatre is magnificent. It is absolutely huge and almost completely intact. I have been to a fair few roman theatres, including quite a few in the area around Orange, and this is probably the finest I have visited (although the one at Dougga in Tunisia probably has a better location). The feature that makes this different to all the others I have been to is that the stage wall has remained standing since being built, and there are still some decorations on it. There are also the remains of a roman temple right behind the Theatre. The Triumphal Arch (pictured) is also well preserved, and the friezes are remarkably intact. It is only a short walk up to see it, and it is nice to see but perhaps only worthy of its place on the list in addition to the Theatre. Orange itself is nothing really spectacular. It is nice enough, but apart from the two sites there is not a whole lot more to do. We spent an afternoon here and that was enough time for us. It is only about 15 minutes by train from Avignon and is a nice way to spend a couple of hours. In our trip to France we have been in the town of Orange, situated on the river Rhone. There you can admire the best preserved and one of the largest Roman theatres, from the Augustean period. The wall of the façade, 103 m long and 37 m high, is completely preserved and has arches and blend arcades. The theatre was deprived only of his marbles and decorations and now there are few remains, like the statue of Augustus (3,55 m high), reconstructed with the original fragments and removed to the central niche of the scene wall; it was used in Baroque period by Maurits van Oranje-Nassau like a quarry and restored since 1840 (in particular the stairs). Adjacent to the theatre are the remains of a temple with circular apse, from the Hadrian period, a gymnasium, an altar and a nymphaeum; on the hill behind them is the capitol. 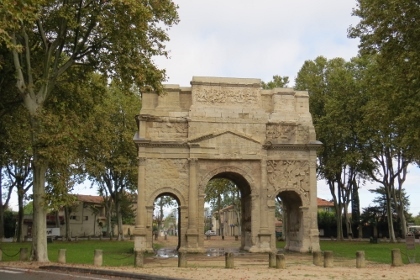 The Triumphal Arch, constructed on the Agrippa Road (that brought from Lyon to Arles) in the period of Augustus, is preserved very well; in the 13th century it became a small fort and was restored since the 18th century. It celebrates the Roman peace and the veterans of the 2nd Gallic legion, that fought agianst the Gauls. It has three arches with coffered ceilings, tympanums, attics, twelve columns and beautiful relieves. Orange is one of the most beautiful places I have ever seen because of the impressiveness and the proportions of its Roman monuments. They are absolutely worth to be visited and justify the inscription also as the most preserved Roman theatre in the world and the most conserved Roman Arch in France, but I think that also other Roman monuments in Provence (like that in Nîmes or Saint-Rémy-de-Provence) could be inscibed alone or together with one, two or all of the WHS of Arles, Orange and Pont du Gard. OK, I'll start off by saying I've seen a good few Roman sites over the past several years. So I have to say that Orange was not one that I would recommend. The Ampitheatre is impressive in its way, but I suggest going during the Choregies, which is a week or two of large choral performances that offered here during the summer. That way you could enjoy the music as well as a quick tour before the show. And the Arch de Triomph here is likewise not worth it. 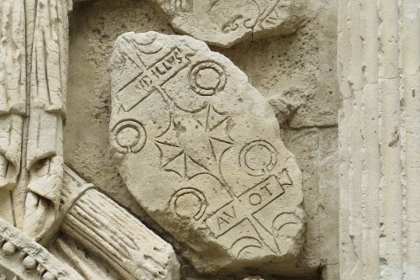 Save your time for better Roman monuments in France, at, say, Arles. Still, if you are passing through anyway, you could stop a take a quick look. But don't give Orange more than 2 hours (unless you're here for the music). Built in the 1st century BC: Theatre built in 35 BC.